Situated along the Thomasville Road corridor just West of Killearn Estates, Shannon Forest is one of the smaller neighborhoods to which buyers are flocking. The two biggest attractions claimed are A-rated school zones and prime location. Just as we stated in yesterdays report on nearby neighborhood Foxcroft, these prices are not going to last for long. Currently, home prices remain attractive at levels far below that which new homes could be built, just do not expect sub-$200K prices to be available by the end of 2016. It is important to note that the narrative contained below is for sales through December for all previous years, but through the second week of December in 2015. The graphs and the closed sales table will be continuously updated into the future (meaning bookmark this page if you always want to know the current status of homes in Shannon Forest). Average home prices are up roughly 3% over the average closed home sales prices posted in 2014. 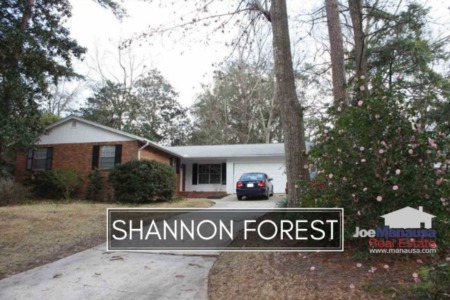 The average recorded sales price has been $188,000 for Shannon Forest through the second week in December. There have been 16 closed home sales thus far in 2015, and this level of sales is consistent with the best of all years going back to 2005, but still 15% to 20% short of the averages recorded in the 1990s. Currently, there are only two homes available in the neighborhood, and they likely won't be there if you're waiting for a New Year's Day special. Average home values in Shannon Forest have risen three years in a row, up from a post-bubble record low set in 2012. Home values rose 2% in 2014, but they have jumped up 12% in 2015. With new homes selling for more than $130 per foot in most cases, you can see why the home values are so attractive right now in Shannon Forest. 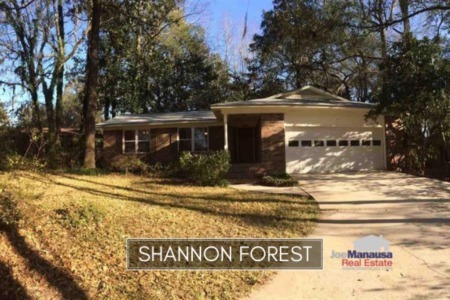 In 2015, the average value of a home sold in Shannon Forest has been $103 per square foot. The average home size sold in Shannon Forest typically falls in a range of 1,800 to 2,000 square feet, and 2015 has recorded sales towards the lower end of this range. The 16 homes sold in 2015 averaged 1,847 square feet, but the two remaining listings in Shannon Forest are much larger. Homeowners who want to sell should get them listed immediately to take advantage of the high demand for NE Tallahassee homes along the Thomasville Road corridor. I hope you enjoyed our December 2015 update on home sales in Shannon Forest, please feel free to drop me a note if you have questions not covered in this report.